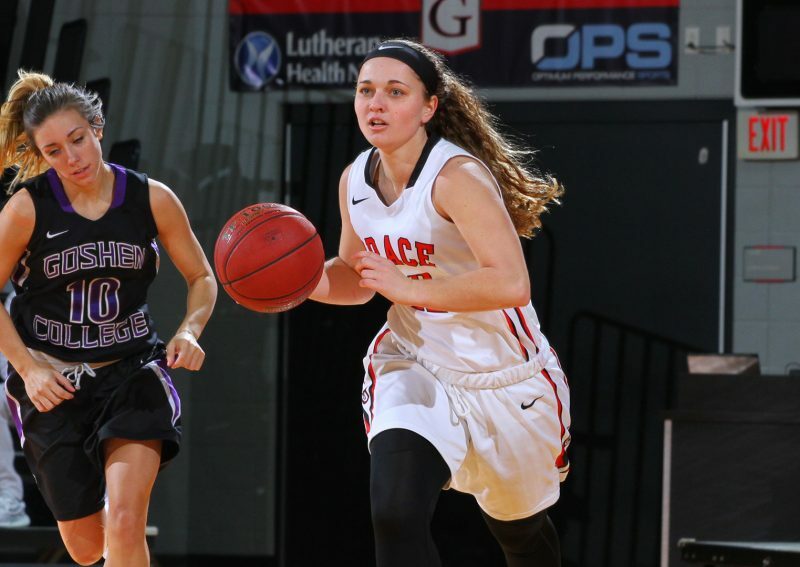 The Grace College women’s basketball team muted Crossroads League foe Goshen 64-55 on Saturday afternoon thanks to a stout defensive effort. The Lady Lancers (12-12, 6-6 CL) nabbed a season-high 15 steals and forced the Maple Leafs (1-23, 0-12 CL) into 20 turnovers. Grace’s active hands on defense produced 21 points off turnovers compared to just eight for Goshen. The Maple Leafs began the game stronger, jumping out to a 9-2 lead after five minutes of play. But the pace picked up for the rest of the quarter, which favored Grace. The Lady Lancers quickly caught up to Goshen and took a 16-15 lead after a clever give-and-go fastbreak connection from Kyannah Stull and Brooke Sugg. In the final 30 seconds, Micaela Box hit a 3-pointer, and Sugg swished a floater in the final seconds to put Grace ahead 21-17. Grace’s defense locked down the Maple Leafs for the next two quarters. Goshen was held to 10 points in the second quarter and 12 more in the third as the Maple Leafs struggled to keep pace. The Lady Lancers, meanwhile, began to pull away in the second quarter. Stull hit a pair of triples in the period, and Kelsie Peterson added another trey. Grace led 39-27 at halftime. Grace started the third quarter with a 3-pointer from Sugg and a bucket by Vironnica Drake, and the Lady Lancers surged ahead by 17. The Maple Leafs continued to battle, however, and slowly chipped away at Grace’s cushion. With 4:19 remaining in the game, Goshen’s Carley O’Neal buried a trey which cut Grace’s lead down to 57-49. But Drake and Pam Miller scored on back-to-back possessions to reassert a double-digit lead, and Grace coasted until the final buzzer. Box led all scorers with 14 points, and Sugg had 13 points and three steals. Miller nearly had a double-double with eight points and 12 rebounds, Drake added 11 points, 5 rebounds, 4 assists and 3 steals, and Stull was 3-for-4 from beyond the arc for nine points. Grace’s defense helped overcome what was otherwise a mediocre shooting afternoon for the Lady Lancers. Grace shot 39 percent from the floor, 33 percent from beyond the arc and 69 percent from the free throw line. The Lady Lancers travel to Huntington on Wednesday at 7 p.m. in pursuit of a season sweep of the Foresters. Grace’s men’s basketball team became the hottest team in the Crossroads League on Saturday with a 95-89 win over Goshen. The Lancers (10-14, 3-9 CL) have won three games in a row, averaging 88.0 points per game in those victories. Five players scored in double figures for Grace, led by 19 points and eight rebounds by Logan Godfrey. Erik Bowen was nearly perfect from the field, shooting 8-of-9 for 16 points, 5 boards and 3 assists, and Matt Jennings filled the stat sheet with 16 points, 7 rebounds, 5 assists and 3 steals. Grace led the Maple Leafs (10-14, 3-9 CL) for most of Saturday’s game. The Lancers’ offense was lethally efficient in the first half, starting from the opening tip. Grace scored eight points in the first two minutes of action and continued its torrid pace throughout the half. The Lancers picked up momentum midway into the half thanks to its outside shooting. Jaret Sons nailed 3-pointers on back-to-back possessions. Shortly afterward, Stephen Halstead hit two triples of his own to give Grace a 37-27 lead with 6:58 remaining. Sons ended the half by making a contested 3-pointer, his third of the half, in the waning seconds, and the Lancers led 53-41 at halftime. Grace shot an incredible 70 percent from the floor in the first half, making 19-of-27 as a team. Grace was 5-of-8 from beyond the arc and also outrebounded Goshen 23-12. The Maple Leafs, who shot 44 percent in the half, forced Grace into 11 turnovers to stay within range of the Lancers. Goshen refused to let Grace pull away in the second half. Although the Lancers never trailed in the half, the Maple Leafs kept pressure on Grace until the final buzzer. Goshen trailed by two with seven minutes to play, and the score remained close for the next four minutes. Godfrey helped Grace gain separation with four straight points, followed by a layup from Haden Deaton to give Grace a 79-71 lead with 3:10 to play. The Maple Leafs did their best to extend the game, sending Grace to the free throw line for much of the last two minutes. The Lancers in turn drained 12 foul shots down the stretch to hold on for the win. Sons finished with 11 points and five rebounds in 17 minutes of action, and Deaton ended with 10 points. Braxton Linville racked up 7 points, 9 rebounds and 7 assists, Halstead chipped in seven points, and Charlie Warner did not miss a shot for his seven points. The Lancers hit the road on Tuesday, playing Huntington at 7 p.m.
Grace’s track and field team put on a strong showing at the Defiance Invitational on Saturday. The Lancers won five events, including four on the men’s side. Karla Singer impressed on the women’s side, winning the 5,000-meter race in a time of 20:18.05. Ben Rankin won the 3,000 at 9:26.82, and Carter Meyer ran the mile race in 4:34.31 to win. The men’s 800 was dominated by Grace as the Lancers claimed the top five spots. Sam Hall took first place in 2:01.06, and Jonathan Balda, Brendan Hamilton, Brady Willard and Meyer were 2-5. In the final race of the day, Grace claimed its fifth win. The men’s 4×400 relay team of Joshua Pridgen, Hamilton, Willard and Hall crossed the finish line in a winning time of 3:29.56. Pridgen’s well-rounded day included a pair of third-place finishes, including the 60 meter and the 200. Balda was runner-up in the 800 (2:02.39), and Isaac Stuckey was runner-up in the weight throw at 57-feet-6.25. Jacob Brown was fourth in the weight throw, and Caleb Brown was one spot behind. Jesse Zvers finished third in the 3,000 at 11:49.08, and Quinn Shelton had personal records in the 60 and 200 races. Abbie Evans had a PR in the weight throw, Emily Breininger was fourth in the 3,000, McCalah Mast was fifth in the mile, and Cameron Johnson ended sixth in the 200. The Lancers continue the indoor season with the Indiana Wesleyan Invitational on Feb. 3.